Welcome to the page for Annan Old Parish Church Sunday Club!!! Here you will find recent news and suggested topics, alongside artwork and information. Sunday Club is for children 3 years old onwards. It meets every Sunday during term-time from 11am until 12.30pm in the Church Hall. New members are always welcome. During Sunday Club, the children attend the Church for a short while then go back into the Hall for craft and games associated with a set Bible text. If you know any boys or girls aged three upwards who would like to join with the children at Sunday School, please bring them along to the Hall at 11am where we will happily welcome them to our group. 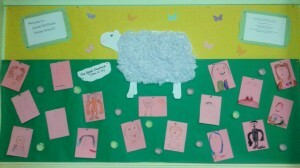 The picture above is an example of a recent craft activity for topic: The Good Shepherd (John 10:14). 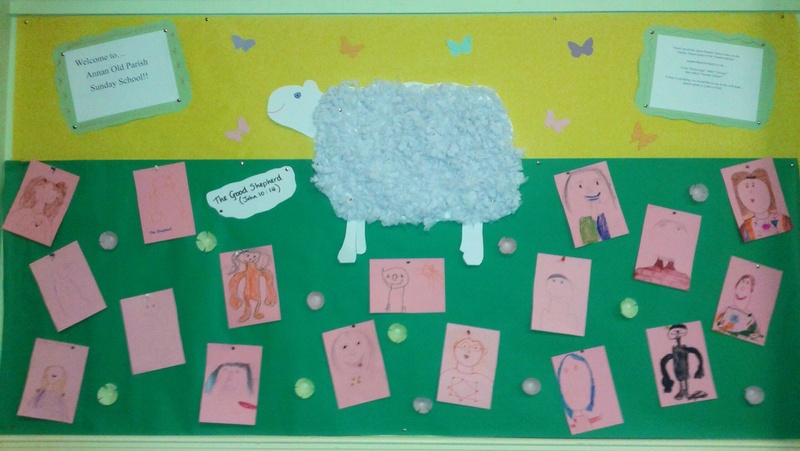 The children worked together to form the sheep made by scrunching tissue paper and gluing onto card. This resembles the sheep missing from the flock. They then drew a picture of themselves to remind them God knows each one of us and each one of us is important.